Supervision of 8 PhD-projects (6 ongoing and 2 completed). The main objective of this research is to develop the urban and landscape plans considering the conservation of heritages’ visual environment simultaneously. Most World Heritage sites have a close spatial relationship with urban areas or clusters of settlements. As with the trend of urbanization and local exploitation, the contradictions between preserving the heritage and people’s desire of regional development are becoming more intense. Though the well-balanced protecting processes could be complex, one of the crucial conservation fields is to preserve the visual environments of the heritage, since the visual perception plays the most important role in humans’ perceptual process. In this research, fundamental concepts and notions will be confirmed or defined, and the former research and methods will be reviewed and surveyed. In addition, a few technological methods, including several promoted algorithms and GIS-based methods, will be introduced and applied in the researching process. Furthermore, the World Heritages in the Netherlands and China will be classified, and four cases will be carefully selected and comprehensively analysed (visual-spatial characters, preserving policies and managing strategies). The objective of this research is to identify design principles for landscape infrastructures in high-density urban development. Accelerating rates of sea level rise will increase coastal erosion, creating worldwide growing demands for durable coastal protection and occupation along sandy urbanized shores. This project aims to develop knowledge, tools and design principles for dynamic occupation of the land-sea interface, to enhance natural processes and exploit its potential for the spatial development of multi-functional coastal environments – shore-scapes. It focuses on coastal urban configurations integrating pro-active sediment management using the ‘building-with-nature’ (BwN) technique. Better understanding and integration of these natural land-shaping processes gives way for new conditions in sediment dynamics and settlement. Their interaction offers the potential to create new ‘coastal buffer zones’ combining flood defense, urban & ecological development and spatial quality. The sandy, dune-aligned west coast of the Netherlands is employed as a Living Lab to study interaction of Aeolian sediment flows and building-configurations in the beach-dune environment. Here spatial design principles will be developed to support these dynamics in order to contribute to the natural adaptation and sustainable development of urbanized sandy shores worldwide. New Towns in development across the African continent since 1990 are overwhelmingly designed and built according to urban planning models from the twentieth century. Although these typologies range from functionalist Chinese grids to American gated communities, the results are—with notable exceptions—New Towns with rigid physical infrastructure and strict building regulations, that do not support spatial manifestations of the ‘informal’ sector such as kiosks, spatial appropriation or mass transport. As a result, these New Towns become insular enclaves and informal settlements develop adjacently to them, without access to the services and amenities offered within the New Town. Coupled with the implicit vulnerabilities of emerging and threshold economies, the rigidity of the imported urban models and lack of consideration for climate change threats, exacerbate spatial segregation and respond ineffectively to surrounding natural landscapes. Building on the arguments that equal access to resources is a key component of sustainable development, and that urban planning benefits from new linkages between critical social theory and environmental science, this research proposes that applying adaptive urban planning principles to New Towns in the African context can increase ecological sustainability and social inclusivity. The objective of this research is therefore to address the spatial challenges of African New Towns by developing an alternative planning and design approach that acknowledges both social and environmental dimensions, as well as the constant state of change that all cities exhibit. 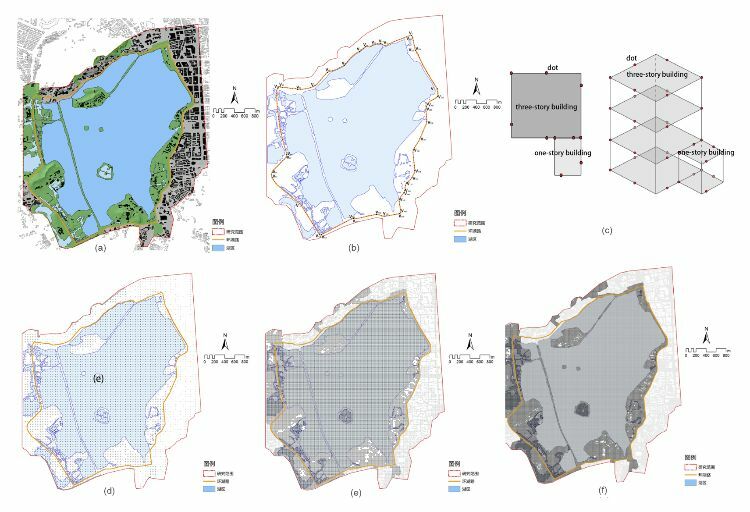 To do so, this research develops and applies a set of landscape-based adaptive spatial planning principles that address the different capacities, requirements and resources of both planning institutions and residents. Mapping spatio-visual characteristics is important for understanding landscape spaces and crucial for landscape design. Therefore, developing design vocabulary and mapping methods, exploiting the capabilities of modern technology, to describe and interpret spatial and visual properties help spatial designers to achieve a better understanding of landscape compositions and enhance effective communication. The objective of this study is to identify and develop spatio-visual landscape characteristics for mapping landscape spaces. Research questions include 1. How to characterize spatial and visual landscape and what are potential key indicators for mapping landscape spaces? 2. How and what tools can be used to describe spatio-visual characteristics of the landscape? 3. How to use and evaluate the mapping results into design assignments? In order to answer the above questions, literature about the spatial and visual landscape characteristics and potential mapping methods are reviewed. The Vondelpark, a well-known urban park, serves as a case study for applications and experiments. Based on the theory, fieldwork and computational analysis, different mapping methods/techniques are used to describe landscape spaces. Then, in order to show how to use the clues into practices, two to three rounds of design assignments will be organized to meet different design intentions. In the end, an expert panel will be organized to evaluate and give suggestions to improve the findings of this research. Through mapping experiments, design assignments, and expert-judgment to evaluate and validate outcomes, the research results in a framework for mapping landscape spaces consisting of a systematic overview of traditional and new spatio-visual landscape characteristics and methods/techniques acquiring them, as well as applications on the Vondelpark enabling to evaluate and showcase possibilities. The objective of the research is to identify a design approach, through all scales of the design, that leads to bridges that are well-integrated, that are integrally-designed and that are valued by society. 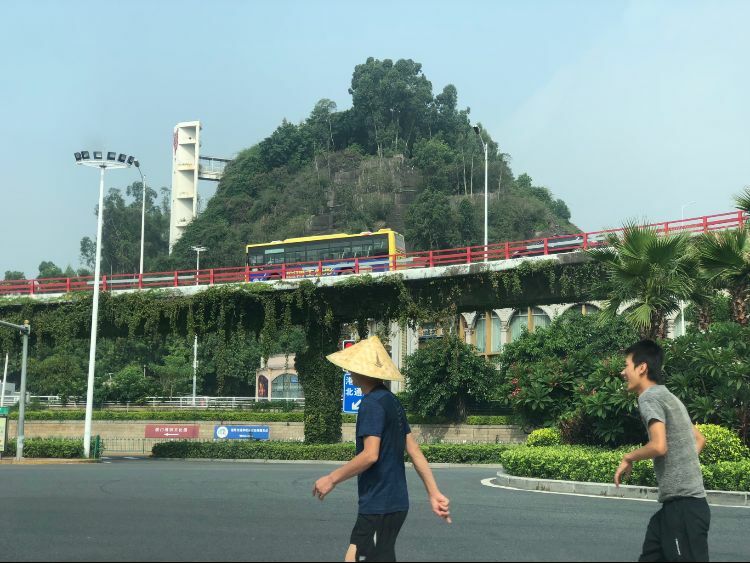 The start is the basic assumption that the introduction of a design integrator will lead to better bridges and will increase public support for new infrastructure. If one person could oversee the design process in its entirety by fulfilling the role of design integrator and by defending the design in the public debate, the design process benefit. The design integrator should not be the omniscient master builder of old, but would instead act as the conscience of the design, the expert who directs and coordinates all design aspects of a bridge. When we look at other large structures in the public realm, it is noted that the role of design coordinator is not new in the building industry. By far the largest part of manmade structures in the built environment are buildings. For every building design there is already a design integrator in the personification of the architect. For a building the architect oversees the entire design process, including the integration of the structure and of the technical installations. To bring about such a transition into the field of design of infrastructures, the researcher proposes that the role of the architect must be transformed from a mere aesthetical advisor to that of a design integrator. Cities and metropolitan regions are responsible for approximately 75% of the CO2 emissions. They play a big role in the global greenhouse gas emissions. At the same time cities are vulnerable to effects of climate change such as flooding. The objective of this PhD research is to develop a framework for urban landscape planning for the transition towards a more sustainable city and explore potential synergies to improve the quality of life. This question is placed in a context of a ‘cities as urban ecosystems’ model. Quality of life can be divided into spatial, environmental, socio-economic and economic issues and synergies between them. As it is a broad topic to address, in this thesis it will be approached from the perspective of the ISO37120 standard: city indicators for city services and quality of life. To get a grip on this matter as well as to simplify the complexity of all interacting actors, the methodological framework is first used for sectoral research lenses chosen for the case study city Rotterdam. These lenses are: water, energy and nutrients (food). From this sectoral perspective synergy effects will be explored. For instance, solutions for water might as well incorporate strengthening of biodiversity (more gradients), infrastructure connections (new dikes also used for biking) and recreation (ponds). If the same is done for other sectors overlapping will occur over time. 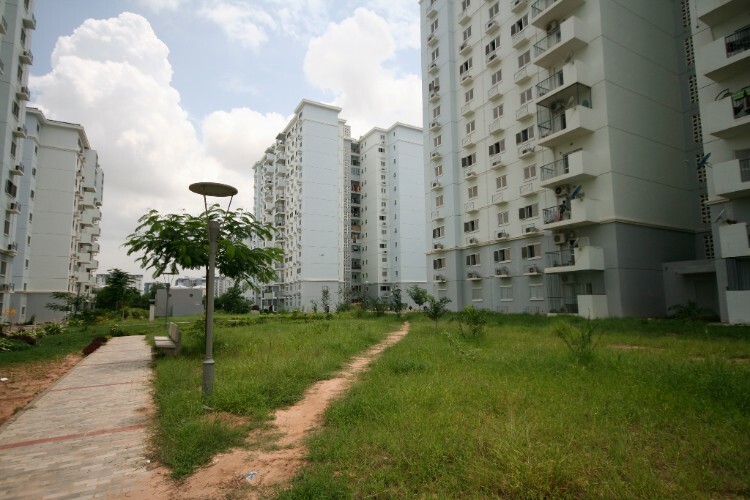 The research lens approach is an important part of the exploration strategy to look for potential synergies but also to explore new approaches to link urban metabolic flows to urban landscape planning. With the gained knowledge and implementation in the city of Rotterdam, a practical framework to reach liveable low-carbon cities will be built. This Framework links to the latest new insights on using city data, smart cities, urban metabolism, energy planning climate change and resilience. 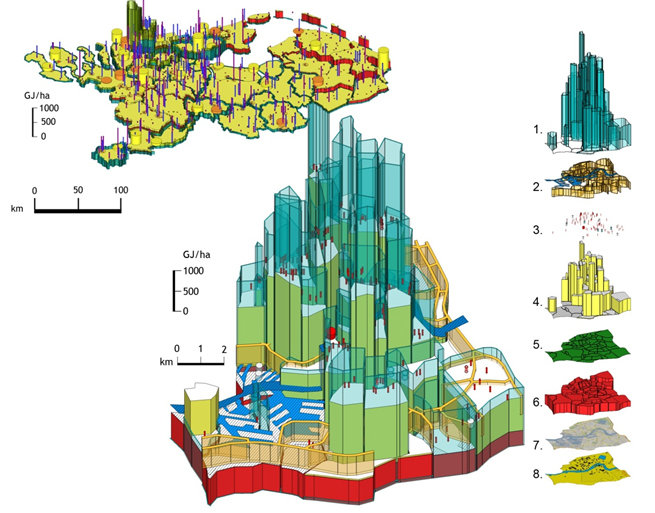 It is a translation from CO2 , energy and climate adaptation goals into spatial urban rules and principles. Urban deltas belong to the most promising regions considering their population concentrations, ecosystems service and economy significance. Meanwhile these regions are facing multiple threats and are extreme vulnerable for increasing flood risk, damage of social and ecological values and substantial economic losses. These challenges are demanding a fundamental review of the planning and design of urban delta landscapes and their spatial networks, in particular in relation to environmental issues and sustainability. Systematic study of urbanized delta landscapes is essential as a basis for future-oriented action and thinking for the sustainable development of these rapidly changing landscapes. This research aims to develop a multiscale approach to understand and represent urbanizing deltas as complex systems composed of subsystems, each with their own dynamics and speed of change. As a system the urbanized delta landscape is a material space that is structured as a constellation of networks and locations with multiple levels of organization at different spatial and temporal dimensions. Map-ping the peculiar form of these systems provides insight into the complexity of the built environment and the related spatial networks – and with that, understanding in important social and ecological relationships. 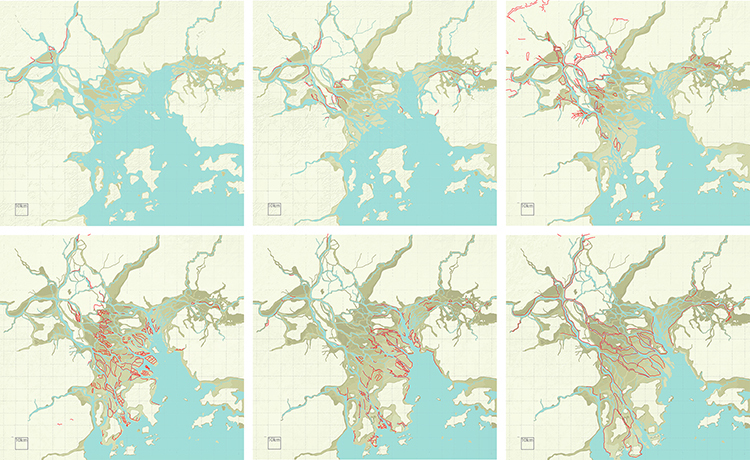 The Pearl River Delta, one of the quickest and most densified large scale urbanizing deltas of the world, serves as a case study how mapping can be used as a powerful tool to reveal relationships be-tween landscape, networks and urbanization.